The trunk can be opened using the key, trunk opener, entry function or wireless remote control. Pull up the lever to release the trunk lid. Turn the master key clockwise to release the trunk lid. In this case, the trunk lid can be opened using the entry function. 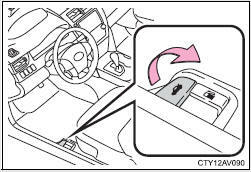 ●Even when the electronic key is put in the trunk with all the doors are locked, the key may not be detected depending on the places and the surrounding radio wave conditions. In this case, the key confinement prevention function cannot be activated, causing the doors to lock when the trunk is closed. Make sure to check where the key is before closing the trunk. The trunk lid can be opened by pulling up the glow-in-the-dark lever located on the inside of the trunk lid. ■Caution while driving ●Keep the trunk lid closed while driving. ■When children are in the vehicle Observe the following precautions. If a child is accidentally locked in the trunk, they could overheat or suffocate. ●Remove any heavy loads, such as snow and ice, from the trunk lid before opening it. Failure to do so may cause the trunk lid to fall closed again after it is opened. ●The trunk lid may fall if it is not opened fully. It is more difficult to open or close the trunk lid on an incline than on a level surface, so beware of the trunk lid unexpectedly opening or closing by itself. Make sure that the trunk lid is fully open and secure before using the trunk. 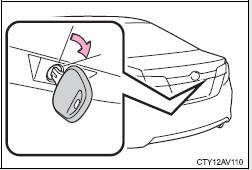 ●When closing the trunk lid, make sure to press it lightly on its outer surface. ●Do not attach any accessories other than genuine Toyota parts to the trunk lid. Such additional weight on the trunk lid may cause the lid to fall closed again after it is opened.